Mobile MIG Ltd, was set up in 1980 in Lowestoft by Bob Kirkwood who served his welding apprenticeship in the Glasgow shipyards back in 1966. Bob employs a skilled team of welders who form a skilled, reliable and flexible workforce capable of welding any metals. Bob and his team are all members of the Construction Skills Certification Scheme, which includes testing on all skills and health and safety awareness. 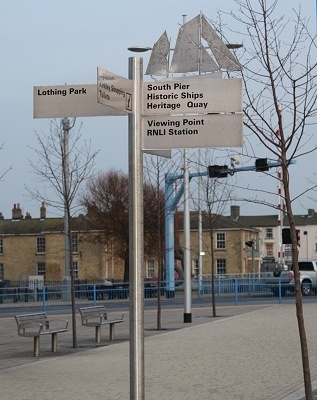 The image right shows a road sign manufactured by Mobile MIG Ltd for the Lowestoft Sunrise Scheme, part of the Lowestoft regeneration plans to bring more work and prosperity to the area, including new roads and access to the region. Many more signs, posts and railings manufactured by Mobile MIG Ltd are seen throughout the town.